The second miniature of my Tasting Pack is the Bruichladdich Rocks, the 2008 version. The nose of the Rocks is fairly sweet without really being sweet. You follow? I get some apricots and vanilla and leather, albeit less than on the Waves. No farmy notes here, but something that reminds me of aspirin. Or an effervescent tablet. Weird, but it works. After a few moments, some stable scents do appear and it suddenly turns quite creamy. Nice. Darn! The first thing that hits the tastebuds is a big floral note, almost perfume! Even worse than on the Waves. Luckily there is enough fruit and spices to mask this. The fruit is bigger than the nose let on. Think apples, apricots, raspberries and a bit of grapefruit. Midpalate it turns oaky bitter. The finish is short to medium long, just like the Waves, but with more liquorice at the death. It leaves your mouth dry. Nice nose, but on the palate, the floral element is just too big. I do not expect this from Bruichladdich. Directly from the Website of Bruichladdich, "A bracing, light and floral dram that expresses both the marine top-notes of classic Bruichladdich spirit and master distiller Jim McEwan’s lifetime experience." I wouldn't necessarily agree with the "Floral" Dram description, its definitely there but still a very fine Malt indeed. It was a surprising experience for sure. it says "unpeated" on the label but there is just a hint on both the nose and palate of very very light smoky peat. Very Yeasty. In the BEST possible sense. such a unique chewy Yeasty dram. I am not an easy to please, though not overtly stingy Malt drinker but when something hits just right, by GOLLY, it hits hard. Its Light on the Nose to me. Nothing too intense. I wish it was more memorable honestly. YEAST! Chocolate on the nose, with a hint of wine. Palate wise?? As far as tasting notes go, i am going to focus on the Chocolate and the Yeast, its really predominate, like a Biscuit(dinner roll). Some Grapes, OAK, and a light pepper. Its not very Islay to me, but its not a bad thing. Islay is my favorite region(arguably most peoples favorite region) but it uniquely independent. It is great on arrival, with a solid Barley finish. I strongly recommend this Whiskey and am equally surprised this has not received higher marks. Very Solid Dram. 2 Teaspoons of water, no ice. let it open up and when you first sip it, CHEW it. You will thank me later. My Apologies for jumping around, i was multitasking while writing this review and the result is some jumping around, and quite a few obvious non sequitur. It wouldn't let me go back and edit the actual review. Nose: Not your typical Islay! Quite malty. Grainy cereal notes with a hint of sweet brown sugar and a whisp of something tart like pomegranate seeds. The light touch of peat hovers just below the surface. Body: full bodied and thick. Palate: chocolate malt, cinnamon candies, and red wine. Finish: Big but short. There's a blast of pepper and smoke, but then it is gone, followed by the slow, lingering licorice after-taste of cough syrup. I picked this one up for two reasons: 1) a video I saw about the distillery's eco-friendly methods and 2) the package design, which is beautiful. But to be honest, for the price, I thought this was a wonderful little whisky. Not what I would normally grab when I long for Islay, but this is a unique stand-in for several Speyside whiskies. Definitely worth a venture. Give it a couple of months and see. You might notice it opens up a bit. Thanks to @MarsViolet for the reviewed sample. Thank you, @Bernancio. I did in fact suspect that the peat flavour that I was tasting came from peated water. It seems bizarre to me to describe a whisky made from heavily peated water as being "unpeated whisky". I can be in the mood to drink a 73 rated whisky once in a while, just not too often. For me, Bruichladdich Rocks is just curious enough to taste that a person can come to drink it occasionally out of curiosity, alone. @Victor, The water used for the mash is heavily peated, almost brown. The water used to cut the ABV down, is Spring water. The malt is unpeated though. I found that I was trying to make myself like this scotch. Fair score you gave it. Simple and nice expression. Young. Palate: Jams again, red fruits (stawberry's, Rassberrys ect. ), hints of pepper, cooked vinilla. Finish: Basically the same as the palate, fades to a vinilla sweetness. Very simple but very nice. Cheep as well. I think I had the 2nd batch of this bottling. Just picked a bottle of this up last week and liked it very much. Did you try it with ice? Must admit this was a first time for me but there is an informative video from Jim McEwan, Brichladdich's Master Brewer on YouTube that suggested trying it on the rocks as an early evening drink and with a little water for later in the evening. I wish I did try it with ice, the whole reason why its called 'rocks' is because its designed to be taken with ice (or so I heard). I managed to finish the bottle before discovering this. Be sure to tell me what you think of it on ice vs neat. Nose: Lemon peel, grape juice, satsumas, mint syrup, bleach. A little dirty, like a beach. There's also a certain artificial fruit flavor that I associate with lollipops, gummy candies, etc. Taste: A bit briny, sea air. Quite maritime in nature, however, the wine finish seems to have "candy-coated" this one (although this isn't a particularly sweet whisky). Finish: I'm fairly certain there is at least a little bit of peat in this. Brine comes out with a bit of earthy tobacco. Overall, this isn't a bad whisky, it just seems that whenever I look over my bottles, I never want to drink it. Kind of disappointing because my first impressions of it were good, however, the more time I spent with it, the more my enthusiasm for it faded. @dellnola Thank you for a careful and honest review of a whisky that I've always been curious about. It is interesting and informative to read about whiskies that surprise the reviewer, both for better or worse. This must be one of the best value malts on the market. It's apparantly un-peated but its so rich and full on the palate that you wouldn't know it. I absolutely love it. Extra points for the price, it's tastes way more expensive that it costs. Nose - Marshmallow, oak, figs, liquorice, vanilla and spice. Among the most rewarding and complex noses I've tried so far. Palate - Teacakes, berries and old oak. Oily and some sea salt. Very rich and fulfilling. Finish - Medium long, slightly medicinal with lots of spice and wood. There is some smoke in there which suggests its peated though the label says no. If you buy from asda right now (28th June 2011) you can get this for a mere £20. Amazing value. An enjoyable review Mattatec, that seems pretty darn good value. I shall be adding this to my wish list. Suppose that you would like something more interesting and assertive than a Speyside, but less overwhelming than tar in a bonfire. Well, Bruichladdich ROCKS is one of my favorite go-to, all-rounder malts. ROCKS is part of the distiller’s Multi Vintage Malts seriies … per the distiller: A range of Designer Malts masterfully tailored by Jim McEwan for specific palates. From the distiller’s website, it appears that I am reviewing the “Rocks New” bottling, with the gray-scale/silver label. ROCKS has no age statement, and it is concocted from a range of several vintages, malting levels and cask types. Moreover, the component vintages are mixed together, and then further matured in French red wine casks. The bottle label states that ROCKS is an unpeated Islay single malt with elegance and sophistication … and that it is a multi-dimensional bottling. I do agree with all of the distiller’s adjectives, but having so many other unpeated malts, if I had read the “unpeated” part in the label first, I might not have acquired it. But somehow my senses pick up an elegant and desirable balance of peat/smoke as one of the dimensions. And alas, the distiller’s website agrees with me, and claims that ROCKS is lighted peated. So stick to your noses and palates folks ! 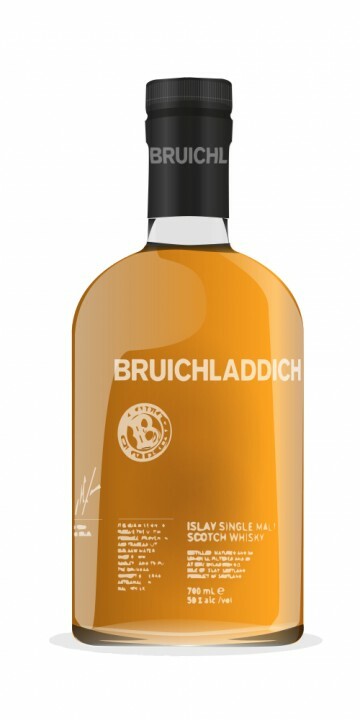 Bruichladdich bottles many expressions at 46%, which I feel adds to their potency, excitement and robustness. Most of my favorite go-to malts are bottled at 46%. ROCKS is also un-colored and un-chill-filtered, which adds a friendly dimension to it all. No water was added for this tasting. Bottle Nose: Fairly potent deep sweetness, glue, little smokiness … very alluring. Glass Nose: Exciting and pungent medicinal brininess and candy … maybe a bit of fruit … my kind of aroma for this type of mid-range malt … gives me that illusion of a Scottich sea. Palate: Lively rush of deep sweet tangy, gluey, salty, then nuts and fruit, maybe a little caramel, followed by a good deal of mild almond smokiness. Very complex and balanced.. Finish: Warm medium tangy finish with a good-quality glue, and maybe cookies & vanilla, followed by a lasting aftertaste of pleasant almond smokiness. Conclusion: ROCKS is everything I really like in medium-smoky, exciting single malt: a well-done balance of sweet effervescent tanginess and saltiness, infused with a light amount of pleasant and mild smoke. Currently I have found only three other malts in this category … can the reader think of some others ? Although ROCKS would likely not be appreciated by a malty neophyte (maltyphyte? ), it is a highly satisfying mid-range malt for the more seasoned explorer. Rating 92, in this assumed category. OK, I’ll bite … I am trying ROCKS on ice ! But what does that mean: “on-ice” means that during the course of the enjoyment of the dram, you will experience a continuum of chilled dram to very-chilled and very-diluted dram. So on the onset, we have a cool and intriguing flavor profile … reminds me of the cold, briny sea in the coming months. But as we melt on, the profile remains, but gets weaker and colder … better drink up before the tide comes in … at least they bottled at 46% to give you a little more time. The on-ice taste and experience is certainly novel, but it is quite one-dimensional when compared to the warmer and neater experience without ice or water. Alternatively, if you must, try it chilled, but without ice. Alas, I feel a little remorseful, and encourage you Not to try this at home. I'm working my way through a bottle, too. Have you tried it with ice? I only drink single malt neat, but decided for once to throw in ice because I read that Jim McEwan intended Rocks to be good on the, well ... rocks.